It is your small, high, hateful bugle in my ear. Hollywood Bliss Winterman is the daughter of super-famous pop-star Kandhi. 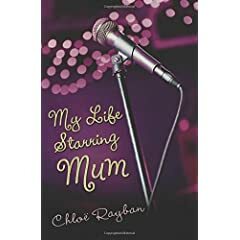 She doesn't see much of her ever-on-tour mother until Kandhi suddenly pulls her out of private school and moves her into the plush Royal Trocadero Hotel with the vague explanation that there was some sort of security risk. At first, she's upset about leaving her friends and her school, but she's excited about the prospect of spending time with her mother. She quickly realizes that life at the Royal Trocadero is Not For Her. When she needs to talk with her mother, she has to schedule time with Kandhi's PA -- and she's lucky if she gets twenty minutes. She can't go anywhere without a hulking bodyguard, and when she does go out, she has to wear hideous spandex clothing from Kandhi's teen line. When Holly asks for a tutor so that she can keep up with her schoolwork, her mother gets her a voice coach and a dance instructor. That's the first clue that her mother might be making plans for her future without consulting her. I did a complete 360 on this one. Oh, God. Yet another Hollywood/spoiled rich girl book. Why even bother? Hey, this isn't so bad. Holly isn't actually spoiled, her life as the daughter of mega-star Kandhi is actually sort of nightmarish. ...and a total doormat. The secondary characters are mostly two-dimensional. Also, it's kind of dull -- which is upsetting and surprising, considering the plot possibilities. Oh my GOD, it IS a typical Hollywood/rich girl book -- it's just that the rich girl is Holly's MOTHER. She's AWFUL. Fans of rich-girl books might (MIGHT) like this, if they don't mind the lack of action and Holly's doormattishness. Robie Harris has a new book coming out! Dude, COME ON. Is it really necessary to write an article warning people about the dangers of this book? It's called It's Not the Stork! WTF do you THINK it's about? Not to mention the fact that -- obviously -- no one is forcing you to read it to your kids. ...when you're a seventeen-year-old Orthodox Jewish girl with purple-and-burgundy-streaked hair, ripped denim skirts that come down to your ankles, and death rock T-shirts—you don't look like you're holding back. I had this friend last year who decided that she didn't believe in G-d. She ran away from her parents' house and lived in a squatter house with a pack of hippies, eating ninety-nine-cent bags of potato chips and beef jerky. She came back a month later, still atheist, just not as loud about it. That wasn't me. I still believed in G-d. I just didn't believe in other people. I mean, some days, I felt like G-d was the only one who believed back at me. Just before summer break begins, Hava is offered a spot on a new sitcom about an Orthodox family. She trades her neighborhood in New York for a soundstage in Los Angeles, a community where almost EVERYONE is Orthodox for a community where almost NO ONE is Orthodox. Because, you see, she's the only actor on the show who is even Jewish, let alone Orthodox. I wanted to like Never Mind the Goldbergs so much more than I actually did. The beginning showed so much promise, but then it just sort of... devolved. It has some very strong points—Hava is truly a believer, she loves and takes comfort in her religion and way of life WITHOUT being overly pious, judgmental about others, a hypocrite, or any of the other unattractive characteristics that often pop up when religion is dealt with in YA literature. The time she spends at the Blue Hebrew House, where she finds her real soul-mates, is particularly joyful. It was a nice change from the typical stories that deal with religion and belief. Her voice is original, sarcastic and smart. She swears like a sailor. I took to her immediately. But it wasn't enough. The book plodded. It was far too long, things happened too randomly, there wasn't much in the way of character development. Her relationship with Evie made NO sense. Lots of stuff happened, but it all felt pointless. For example: Her best friend, whom she's known since they were crawling, comes out to her. Okay. A) Hava's pretty perceptive. I don't buy it that she wouldn't have had any sort of inkling. No clue? None whatsoever? And the reason that he was forced to tell her? You don't put the moves on your best friend—sober—without obsessing about it long and hard first. There's too much to lose. B) There was no reason for it in the plot. It just felt thrown in, maybe to show that Hava's down with homosexuality? I don't know. I realize that there are random events in real life, but if it does nothing to further the plot or to flesh out the characters in a book, it just seems extraneous. As I said, the book was already too long. But my major problem was The Producers. What was that scene all about? Behind a bookcase, I saw a pudgy, bearded Santa Claus-like face peek out. The head was framed in a black hat. Hasidic side curls poked out from beneath his hat. He did a double take when he saw me. The Producers discuss her as if she isn't there—not her acting, but her faith. It all felt very much like the whole experience was a big test. Which made me almost hate the book. I'm sorry, but as far as I know, TV producers are concerned with the Bottom Line. Not with bringing random Orthodox girl in from New York to test her faith. If it had turned out to be a reality show, it would have worked. Maybe. But it wasn't and it didn't. I haven't even read Flanimals and I'm jazzed about this. Am I the only person who didn't know about this? And is it wrong that I'm feeling a bit skeptical?